Custom Engineered on demand. Model shown: Omnicube - Overhead Mic. Tell me about your audio needs and I will come up with a solid solution for your budget. If it is a special microphone, and adapter box, a special pre-amplifier or other interfaces. Let me help! Happy customer s include: a recording studio using a consumer type DV digital videa camara to feed live sound at +4 db from the console into the Microphone input of the camera. The Californa Academy of Sciences and clients needign specila pre amplifiers for various aplications. Description: This vintage Electro Voice 630 Microphone is of dynamic nature and known to be a prefferred Blues harp Mic. In it's original days this mic was known as a vocal stage Mic, but also today gets high ratings for outstanding clarity in Ham operator circles. Features: Can be svivelled up and down. thread to be mounted on top of a mic stand (see Mic stands below!). 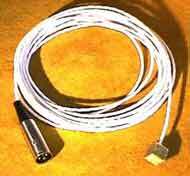 Has an on/off switch and offer a jack for detachable connection (female jack for 1/4" plug - any 1/4" to 1/4" cable will work) Low impedance: as the internal low to high impedance transformer was defective, it was removed and now brings out even more detail in sound at low impedance! Condition: Fully working with minor signs of use. Picture shows the actual item. happt to e-mail high res picture. Lot: 1 Electro Voice 630 vintage Mic.  Buy  Secure and Easy Payment through Paypal. Will refund shipping cost over payment that is added when using the shopping cart and bill by actual shipping cost to your location. Description: This vintage Austrian made mic was manufctured by AKG and distributed under the Norelco Name. The model number on the Mic is CTM-86. The label on it says: "Norelco CTM-86, M / S, Made in Austria by AKG GMBH". I beleive this microphone was manufactured for use with the famous portable UHER Report Reel to Reel tape decks. The cable of this Mic features 2 DIN plugs one for the audio signal the other for the momnetary push button switch mounted inside the Mic handle. There is another switch that physically moves a felt damper over the rear opening of the Mic capsule to change the pick up patters form "M" to "S" to block out sound that may coem form the rear. The Microphone is built iwht a niche AKG 1" dynamic mic element which is rated and labled "200 Ohms". If wanted I can solder a 1/4" plug onto the cable and remove the DIN plugs (no additional cost, but please specify). Features: Dynamic 200 Ohm mic. with pick-up pattern rear damper. Mic has momnetary push button switch, which is wired indepnadantly form the audio signal to allow machine control. Lot: 1 AKG CTM-86 vintage dynamic Mic as described and shown above (1 Mic available - photo: top left). 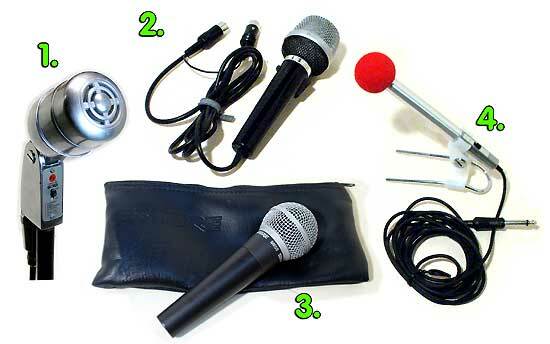 Description: The classical and professional Vocal-Mic and for all around live applications. Mic in eacellent near new condition. As a professional mike made very well. Lot: 1 used in excellent condition SHURE SM58 Mic, plus original Shure zipper bag. Mic as described and pictured above. Description: Nice and rugged quality alluminum boddy - made for Radio Shack / Tandy Corporation in Japan, Catalog number: 33-1050. This Mic features: Omnidirectiona pick-up, 600 Ohm impedance, a sensitivity of -71 db, the frquency response of 20Hz to 13 Khz with a flat response to 2 Khz and then a slight empahsis in the highs. Features: Ultra Slim condenser Microphone - runs on batteries, has powerswitch, wind screen a desk stand and a 1/4" plug. Lot: 1 Realistic / Tandy 33-1050 condenser Mic, 1 original owners manual pamphelt, 1 outer wrapper of the original box (has features printed on it, includes batteries. Description: This Microphone Stand is composed of 2 bars, thus there is one extension that can be raised or lowered. The top section has the standard Microphone-holder thread and any Microphone acccessory can be mounted. Condition: Show signs of use and age, Rust underneath at the core of the metal base. But appears nics - A sshown. Fully functional and looks cool! Lot: as shown, 1 each - specifiy which you need. Description: The heavy metal base of this stand says: "Shure Borthers CO, Model 63A, Floor Stand, Chicago USA". 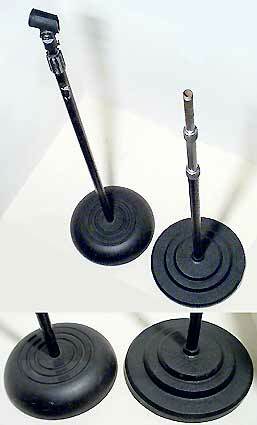 This vintage USA made Microphone Stand is composed of 3 section, that can be raised or lowered. The top section has the standard Microphone-holder thread and any Microphone acccessory can be mounted. Condition: Show signs of use and age, Rust underneath at the core of the metal base. But appears presentable - As shown. Fully functional and looks cool! Features: Can be extened upward to about 61" of total hight or lowered to 25 1/2".